Winning summary judgment certainly does not hurt one’s chances of recovering fees under section 285, but it does not guarantee such a recovery. Indeed, the Eastern District of Arkansas,  the Northern District of California,  the Northern District of Texas,  the Southern District of New York,  and the District of Delaware,  have all denied fees motions despite finding summary judgment of non-infringement, or invalidity, or both. Thus, while a movant’s burden has been relaxed to a preponderance of the evidence, at least one court has noted that movants must still overcome a relatively “high bar” when moving for fees. . Many post-Octane section 285 cases involve Patent Assertion Entities (“PAEs”), also known pejoratively as “patent trolls.” . As noted above, there are certainly some district courts that appear more willing to shift fees in PAE/troll cases following Octane Fitness and Highmark. . This is not terribly surprising given that ongoing patent reform efforts are aimed at protecting companies from abusive PAE/troll litigation, and many view Octane Fitness and Highmark as an extension of those efforts. . 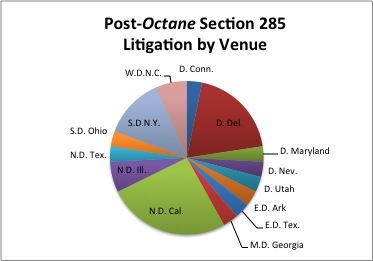 But some practitioners are questioning whether Octane Fitness and Highmark are packing the punch many originally hoped for. . Moving forward, it will be interesting to see if Congress again introduces legislation that attempts to fill any gaps that Octane Fitness and Highmark do not fill, particularly with respect PAE/troll litigation.
. 35 U.S.C. § 285.
. 134 S. Ct. 1749 (2014).
. 134 S. Ct. 1744 (2014).
. Octane Fitness, 134 S. Ct. at 1758.
. Evidence of either subjective bad faith or objectively baseless claims is still, however, highly relevant. Id. at 1757.
. Id. at n.6 (internal citation omitted).
. Highmark, 134 S. Ct. at 1748.
. As of October 31, 2014, the only substantive ruling from the U.S. Court of Appeals for the Federal Circuit on a fees motion was in Homeland Housewares, LLC v. Hastie2Market, LLC, — F. App’x —, 2014 WL 4400184 (Fed. Cir. Sept. 8, 2014) (finding that the district court did not abuse its discretion). 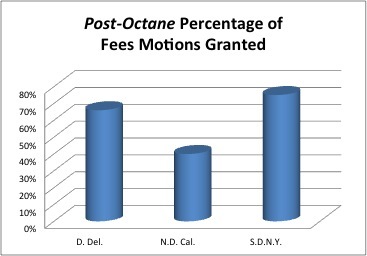 The Federal Circuit has vacated and remanded fee decisions in several other cases that were decided prior to Octane. Two cases from Circuit Courts of Appeal and multiple district courts have also addressed Octane in the context of Lanham Act violations; this article does not address those cases.
. See Wiley v. Rocktenn CP, LLC, No. 4:12-cv-00225-KGB, 2014 WL 4929447 (E.D. Ark. Sept. 30, 2014).
. See Eon Corp. IP Holdings, LLC v. Cisco Sys., Inc., No. 12-cv-01011-JST, 2014 WL 3726170 (N.D. Cal., July 25, 2014); see also CreAgri, Inc. v. Pinnaclife, Inc., No. 11-cv-6635-LHK, 2014 WL 2508386 (N.D. Cal., June 3, 2014).
. See H-W Tech., Inc. v. Overstock.com, Inc., No. 3:12-cv-0636-G (BH), 2014 WL 4378750 (N.D. Tex., Sept. 3, 2014).
. See Small v. Implant Direct Mfg. LLC, No. 6-cv-683 (NRB), 2014 WL 5463621 (S.D.N.Y., Oct. 23, 2014).
. See Gevo, Inc. v. Butamax Advanced Biofuels, LLC, No. 13-576-SLR, 2014 WL 4247735 (D. Del., Aug. 26, 2014).
. See id. at *3-4.
. See generally BRIAN T. YEH, CONG. RESEARCH SERV., R42668, AN OVERVIEW OF THE “PATENT TROLLS” DEBATE (2013), available at http://fas.org/sgp/crs/misc/R42668.pdf.
. Some courts even appear to have changed their position on fee-shifting. See Joel Sayres, A Shift Toward Fee Awards in Delaware, LAW360 (October 16, 2014) (noting the apparent sea change in District of Delaware fees decisions post-Octane), available at http://www.law360.com/articles/586606/a-shift-toward-fee-awards-in-delaware.
. See, e.g., Charlene M. Morrow & Brian E. Lahti, “Highmark and Octane Helped, But Legislation on Fee Shifting Still Necessary,” 88 PTCJ 1705 (October 30, 2014), available at http://iplaw.bna.com/iprc/display/simple_doc_display.adp?fedfid=58407423&vname=ptdbulallissuesdib&jd=a0f7z8e8t4&split=0#a0f7z8e8t4.
. As Morrow and Lahti noted, the legislative reform that died in May 2014 once Octane Fitness and Highmark issued may still be needed, especially the need to identify the real-party-in-interest in all PAE/troll litigation; otherwise, “patent defendants are left with the somewhat unsatisfactory remedy of the state-by-state provisions for bonding” as their only remedy if a PAE files bankruptcy or takes other measures to avoid an adverse section 285 ruling. See id. Posted in Emerging Trends, Intellectual Property Law, Litigation, Patent Law. Bookmark the permalink. Thanks for the information. It’s good to know that hiring a patent attorney can really help you. Like you said, it’s absolutely necessary for businesses to have patents. Not having that professional help from an attorney can really end up hurting you.